Some good friends are getting ready to head north for the summer (that’s the problem with living in Florida: no one else lives here year-round), so we decided to get together for one last dinner party before they head to the Arctic Circle (OK, they’re summering in New Hampshire, but that’s close enough for me). Even though we were not hosting the evening, somehow I ended up preparing dinner – again. I didn’t want to do BBQ and burgers, and I also didn’t want to do a formal, sit-down affair. Comfortable but nice is what I was going for. I’ve done too much chicken, seafood, and pasta recently, so I was grasping for something different to make. That’s when I decided to play The Game. Combing through the fridge, freezer, and pantry I came up with pork loin, purple cabbage, chocolate, spinach, rice, an orange, and mushrooms. So I flagged the chocolate and orange for a dessert. I knew the cabbage, spinach, and mushrooms would work with the pork, but I wasn’t sure how to put it together. So I started playing with ideas in my head. I thought about roasted pork with some sort of glaze, but that sounded boring. Spinach and rice sounded blah. Then I happened to remember the Beef Wellington I made last Christmas. There was a duxelles spread on the puff pastry before it was wrapped up. So I zeroed in on Pork Wellington, but I didn’t have any puff pastry, and going to the grocery store meant I’d have to accept defeat. So I started playing with the idea of stuffing the pork loin with a knock off of a duxelles with mushrooms and spinach. Instead of pulling out a recipe, I just decided to wing it and came up with this stuffing. I also remembered Dijon going into the Wellington, so I brushed the pork loin with mustard before adding the mushroom mixture (and who doesn’t like mustard with pork anyway?). Sautéing the cabbage became a no-brainer after that. Besides, the plate was going to need some color. I think purple cabbage tastes so much better than green cabbage. It’s sweeter, especially when it’s sautéed with some onions. Green cabbage always tastes a little bitter to me. I rounded out the meal with an herbed rice. All in all, I think the score in my head was an 8.7 (that East German judge always brings down the average). Oh well, it’s just a game. Right? Lay pork loin flat with cut end facing you. Using a sharp knife, slice pork loin horizontally from the left or right side. Cut approximately ¾ of the way through, being careful not to cut the loin into two pieces. Open pork loin and place cut side up. Then butterfly each ‘wing’ of the pork loin, beginning in the middle and cutting ¾ of the way through each side. Open each side so you have a total of four ‘wings’ spread across as a single piece of meat. Preheat large, oven-safe sauté pan over medium high heat. Place mushrooms, shallot, garlic, thyme, 2 T olive oil, salt & pepper (to taste) into the bowl of a food processor. Pulse until finely chopped, but not pureed. Transfer to preheated pan and sauté with an additional tablespoon of olive oil until most of the moisture has evaporated, about 5-7 minutes. Once most of the moisture has evaporated, add spinach and nutmeg to sauté pan and heat through (2-3 minutes). Set stuffing aside to cool. Preheat same sauté pan over high heat. Salt & pepper inside of pork loin. Spread Dijon mustard evenly over cut side of pork loin. Add stuffing mixture and spread evenly over inside of pork loin. Beginning with outside end, roll pork loin up. Sprinkle exterior of roll with salt & pepper. Add olive oil to preheated sauté pan and sear all sides of pork loin in pan, 2-3 minutes per side. Once all sides of pork loin are seared, transfer sauté pan with pork to preheated oven. Roast until internal temperature reaches 145 degrees (20-30 minutes). Remove pan from oven, and remove pork loin from pan. Tent pork loin with foil and let rest for 10-15 minutes. Place sauté pan with drippings over medium heat. When drippings are heated, add shallots and sauté for 2-3 minutes, until translucent. Whisk in flour and let cook through for 1-2 minutes. Whisk in white wine, deglazing the bottom of the pan as you whisk. Let simmer for 3-5 minutes, whisking continually. Just before serving, whisk in chilled butter to gloss the sauce. Slice pork loin into 4 equal pieces, revealing pinwheel pattern. Serve over mashed potatoes, herbed rice or cous cous. Top with 2-3 T of pan sauce. 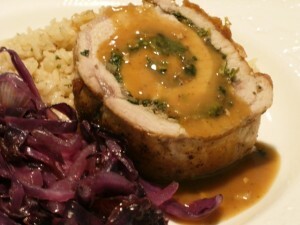 This entry was posted in Cooking and tagged dinner, pork. Bookmark the permalink.